Fort Monroe (1819-2011) - Designed as the first Third System Fort by Brigadier General Simon Bernard and officially named for President James Monroe in 1832. Construction on Fort Monroe began in 1819 and was completed in 1834. First known as Fortress Monroe. Deactivated 15 Sep 2011, declared a national monument 1 Nov 2011. Old Fort Monroe Outer Wall, Bastion and Moat. Fort Monroe Quarters #1, visited by Abraham Lincoln during the U.S. Civil War. Part of the Harbor Defense of Chesapeake Bay. The first fortification built on this site was Fort Algernourne built in 1609 by Captain John Smiths settlers. Other fortifications were built here during the colonial period but did not last. After the war of 1812, it was decided that a system of coastal defenses were needed and Fort Monroe was the first of the Third System forts to be built. 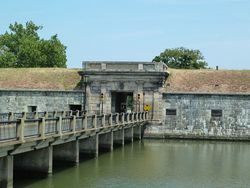 Fort Monroe was built as a seven front, brick and masonry, fort with 10' thick walls and a surrounding 8' deep wet moat. It was first designed by General Simon Bernard for 380 guns, later expanded to a 412 gun capacity, but was never fully armed. The fort was planned for a peacetime garrison of 600 men and a wartime garrison of 2,625 men. The post expanded to cover most of the land at old point comfort and much of the existing post lies outside the walls of the old stone fortress. Fort Monroe was first garrisoned 25 Jul 1823 by Company G, 3rd U.S. Artillery and by 1825 the garrison was the largest in the United States. In 1824 it became the first U.S. Army "Artillery School of Practice". The arsenal at Fort Monroe was established by 1832 and by 1834 it employed 39 workers and was the 5th largest Arsenal in the country. The arsenal specialized in seacoast ordnance and manufacturing seacoast gun carriages. In 1841, it was one of four manufacturing arsenals in the country. The arsenal was not a stand-alone facility, the arsenal buildings were scattered amongst other fort buildings both inside the walls of the fort and outside the walls. Quarters, workshops and the artillery storage were outside the walls while barracks and other support buildings were inside the fort walls. 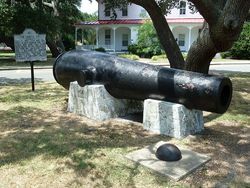 Fort Monroe Lincoln Gun, 15" Rodman Gun. During the U.S. Civil War Fort Monroe was one of the few forts in the south that remained in Union hands for the duration. It proved to be a major factor in the war by limiting the significance of the naval yard at Norfolk and by serving as a staging point for attacks on Richmond. President Lincoln visited the fort in 1862 during the planning for the attack on Norfolk. Fort Monroe was listed as a military prison during the U.S. Civil War but held a maximum of 50 Confederate prisoners at any one time. The Endicott Period saw the addition of 12 detached rifled gun and mortar batteries ranging from 3" guns to 12" guns and mortars. These batteries were stretched along the shore of the Chesapeake Bay side of Old Point Comfort. Three gun batteries were built into the walls of the old stone fort. 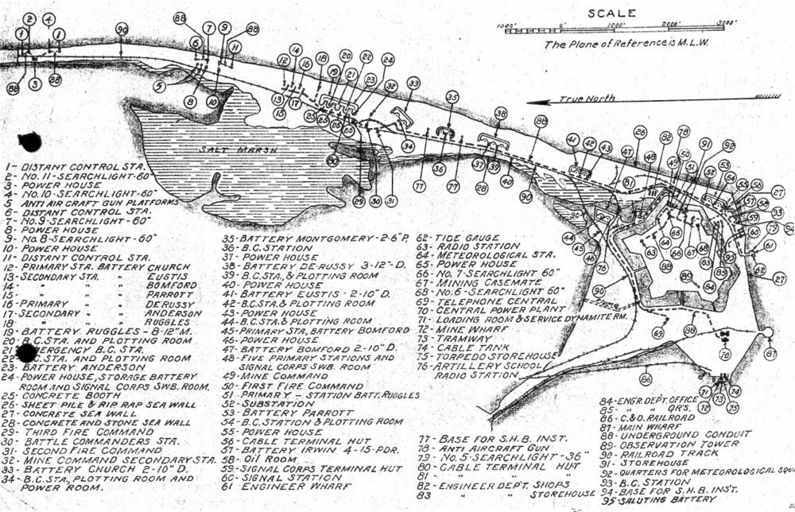 All the batteries were started between 1896 and 1902 but they were not all completed until 1915. Fort Monroe infrastructure expanded between 1906 and 1912 to meet the increased manpower needs of the new gun batteries and the need to train coast artillery officers for all of the new Endicott Period forts and gun batteries around the country. Northeast Bastion Battery 1 10" Disappearing 1900-1908 $ ? Fort Monroe 1879 (Modified 1940), 609 Man Barracks. 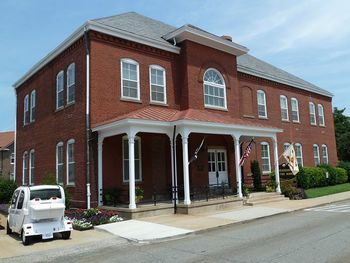 Fort Monroe Coast Artillery Board Building. Fort Monroe became a training camp for artillery officers headed for the war in Europe. Initially, the instruction focused on coastal artillery methods but later the instruction shifted toward the mobile versions of the large caliber artillery. Coastal forts around the country were ordered to dismount specific types of large caliber coastal gun tubes and ship them to arsenals for modification to mobile configurations. Fort Monroe escapes this redistribution of coastal guns probably because it was the training school and the guns were needed for training. Fort Monroe became so crowded that Camp Eustis was established to provide a training camp and embarkation point for troops headed for the front. Landfill was used to expand the Fort Monroe reservation by some 25 acres to hold the increased number of temporary buildings required for operations. With the armistice in November 1918, the focus abruptly changed from training to demobilization although some of the classes in progress continued. After the war, Fort Monroe became the center of coastal artillery activity. Demobilization and massive reductions in the Army's budget forced a significant reduction in that activity. 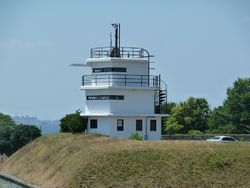 A number of installations and gun batteries were placed in caretaker status because there was not enough funding for manpower and maintenance. Several types of weapons were declared obsolete and scrapped as a result of the disarmament program. Fort Monroe Battery Parrott AMTB. 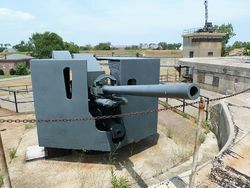 By the start of World War II, most of the large caliber coastal gun batteries on Fort Monroe were obsolete in that they were outranged, slow firing and had no protection from overhead aircraft attack. All of the remaining 10" guns were scrapped during the first large-scale scrap drive in late 1942. The 12" mortars were removed shortly thereafter in 1943. By the start of 1945, all of the large caliber Endicott Period guns were gone and only the 6" guns in Battery Montgomery (2) remained. New batteries were planned for Fort Monroe including 16" Battery 124 and 6" Battery AMTB 23 - Parrott. Battery AMTB 23 - Parrott was built into the old Battery Parrott (1) but Battery 124 was never built. Navy Gun (1940 Program) Not Built $ ? Fort Monroe Harbor Entrance Command Post. 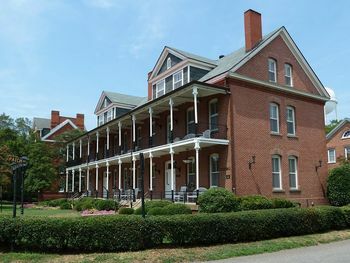 Fort Monroe housed the Headquarters for the Chesapeake Bay Sector of the Eastern Defense Command, a Joint Operations Center (JOC) and Harbor Entrance Command Post (HECP) #2. The HECP was responsible for examining and clearing all ship traffic entering the Chesapeake Bay. Ship traffic volume reached over a hundred ships a day at the end of 1943. Fort Monroe was also responsible for six groups of mines and two Anti-Motor Torpedo Boat (AMTB) nets controlled by HECP #2. Battery AMTB 23 - Parrott provided protection for the minefields and nets. 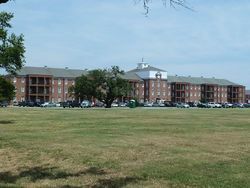 The facilities at Fort Monroe expanded to meet the increased enrollment in the Coast Artillery School and other training activities. In 1946 the Headquarters of U.S. Army Ground Forces was moved to Fort Monroe and the Coast Artillery School was moved from Fort Monroe to Fort Winfield Scott in San Francisco. 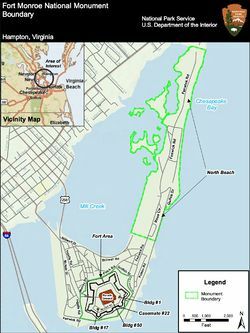 Fort Monroe National Monument Boundary Map NPS. 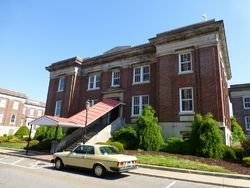 Officially closed 15 Sep 2011 and in transition to the State of Virginia and parts to the National Park Service. 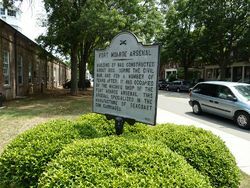 On 1 Nov 2011 portions of the reservation were declared Fort Monroe National Monument. The National Monument includes the old stone fort and parts of the North Shore area. 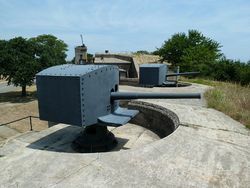 Two mounted guns and carriages are in Battery Irwin and one mounted gun in the Battery Parrott AMTB. This page has been accessed 42,622 times. This page was last modified 10:55, 16 April 2019 by John Stanton. Based on work by Bill Thayer.